You could be on the 147, like Philip and Virginia in this pic. Yes, that's right. 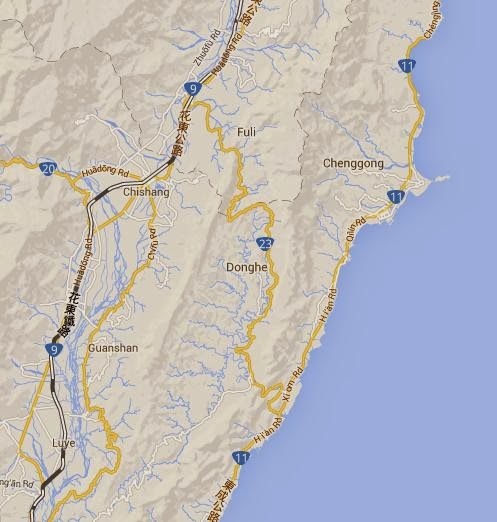 Pretty much ignore everything south of the Dajia River and west of local highway 3. 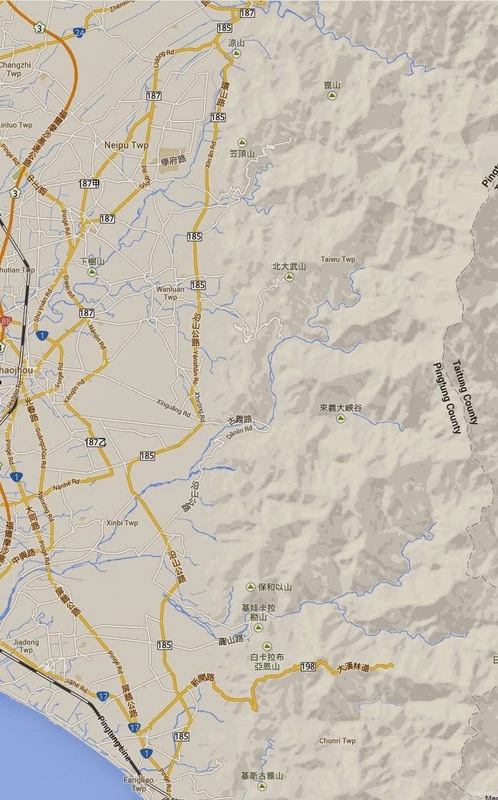 It's flat, boring, hot, dusty, and crowded, except for the agricultural areas of Yunlin and Chiayi, which are merely flat, boring, hot, and dusty. The coast is desolate. You might want to make a quick dash to Tainan to enjoy the city's friendly people and plentiful historical sites, but on the whole, if you have ten days, go somewhere else. Yes, you'll probably have a good time and meet great people, as the WSJ writer did, but the fact is that you can have a better time and meet great people in stunning montane and coastal environs. 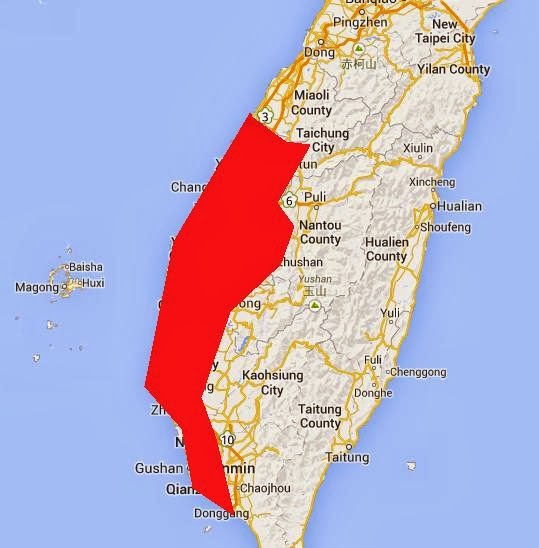 There's no rule that says you have to circle the island, unlike the locals, for which circling the island has become an important way of participating in the Taiwan identity and a key rite of passage for its young people. Instead, spend your time riding some really enjoyable roads. The 159A between Chiayi and Shijhuo. 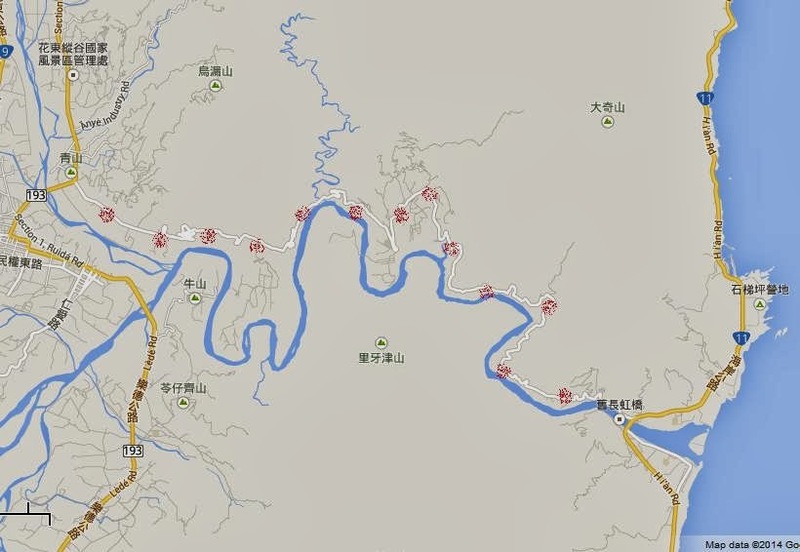 This is forty kilometers of river gorge, farms, mountain walls, and tea farms. Stunning in every way. For my money this is the island's most amazing road, though there are many that are higher and lonelier and grander. You can see some pics of it in the latter half of this post. This is a physically challenging road since you must climb some other road to get to it. As a bonus, you can take the 169 up Alishan, another awesome road, to get to this road. 159A Google maps link. The Nantou 63. This gem requires you take the road along Sun Moon Lake, which I passionately hate, to Ita Thao, the village on the southeast side of the lake where the boats are ported. There next to the gas station you will see the sign for the Nantou 63. You climb to the rim of the basin above the lake, then WHOOOOSSSHHH! Alpine descent all the way to the 16, with staggering mountain views. Sadly I've never done it on a clear, pretty day. Pics here. To get to the Nantou 63, take the 147 to the 131 through Nantou to the lake, then swing around the east side of the lake on the 21. It will be a pretty ride, the 131 is a fabulous road. Nantou 63 Google Maps link. The Northern Cross Island Highway. This road is a sentimental favorite. Once you get above Little Wulai the views just keep getting ever more spectacular. Despite its proximity to Taipei it can be quite empty, if you start early, you can usually put in twenty kilometers on it before the cars come out. You can see it in this post. 7 Google Maps link. The west side of the Rift Valley. On a clear day, this is one of the most spectacular rides in Taiwan, and yet it is flat and low altitude. In fact it is downward trending, starting from the 20A outside Chihshang and ending in Yuli. Hard to find, though -- take someone who knows the way. Like me. At all costs, avoid the 9, heavily trafficked and utterly crappy. Pics here. Google maps link to the area. The 193. 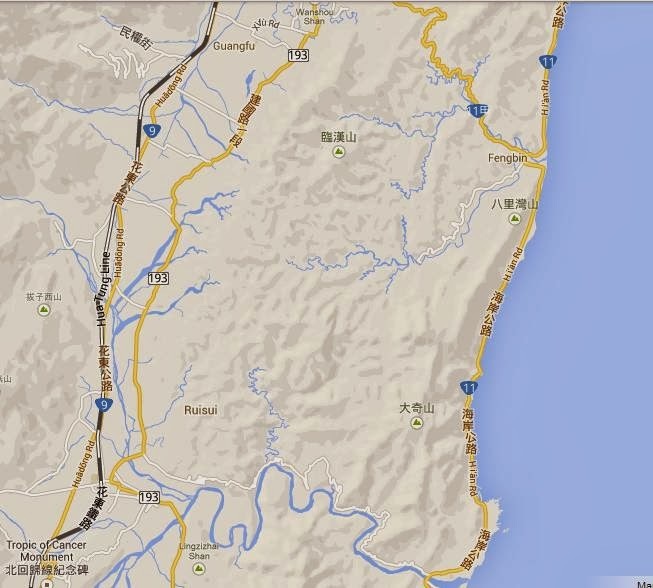 This road runs between Hualien city and Yuli in the east coast rift valley. Unlike some of the other roads I've listed, which are ignored by local riders, this one is considered a must-do by the locals. And with good reason -- an easy, pleasant ride with great views, little traffic, and friendly people. In the spring the fields are full of pheasants and partridges. Lots of shots of this, try this one. Or this one. 193 Google Maps link. The 8 from Taroko to Lishan. This incredible road combines punishing physical challenge -- the climb from sea level to 2500 meters, a lack of food and water stops, and no place to stay except at the top, with spectacular mountain views, wildlife, and incredible gorge topography. Once you leave Tianxiang at 400 meters, there is no place to eat until you reach Shen Mu at 2000 meters. The stretch between Tayuling and Lishan, at high altitudes through the fruit farms, is mind-blowing on a clear day. A few pics here. Google Maps link. The Kenting circuit. 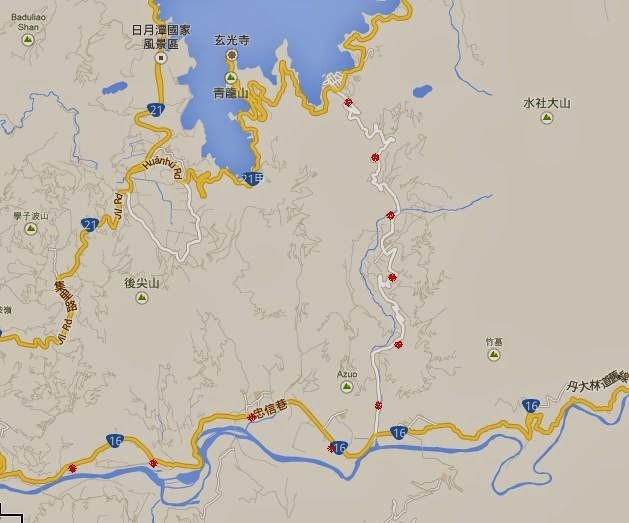 This lovely ride takes the 199 through two historical sites, the Shihmen Battlefield and the Tomb of the Okinawan sailors, and then takes you up into hill and gorge country through a couple of small aboriginal towns, to the 199A and then down to the sea. Swing around the 26, the 200, and back to the 26. An amazing ride, and you can pick up some decent food on Kenting Street on your way home. The first stretch on the 26, still undeveloped, with amazing views back up the east coast, is like no place else. This post has images. Google Maps link. The Hualien 64. This road climbs and falls along a gorgeous gorge. Pics here. The southern county of Pingtung hosts the 185, which runs north-south along the base of the mountains between the town of Gaoshu and the port of Fangliao, which is also the last place before Kenting where you can get a train. This road is physically easy but pretty, traversing some culturally and historically interesting areas with aboriginal villages and old Hakka homes. Some pics here. Google Maps link. Enjoy! Send me an email if you need advice/suggestions. Always happy to help. I have a road to show you in a couple of weeks. What about avoiding the Suhua highway? 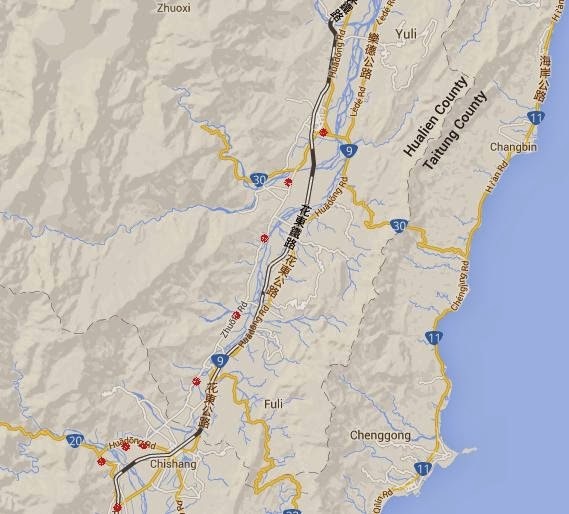 What about avoiding the Number 9 between Suao and Chongde near Hualien? 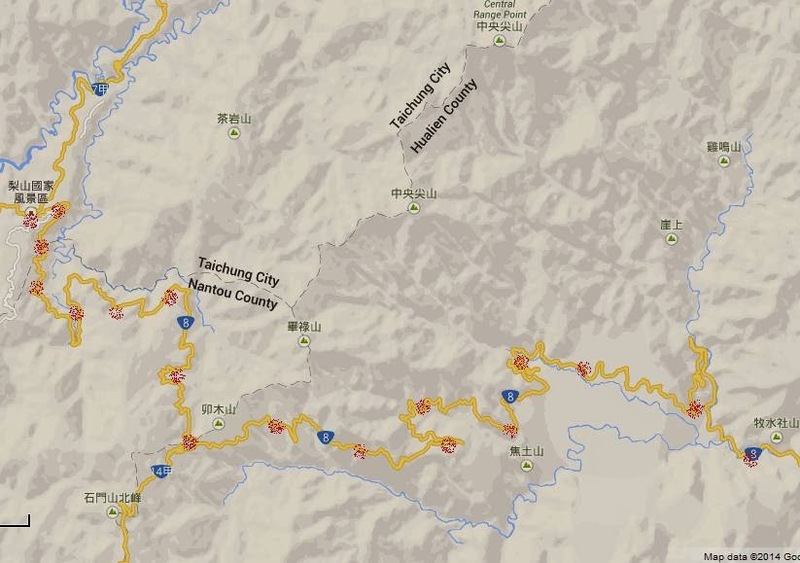 Puli to wuling then down to hualien by Taroko gorges is a must do. 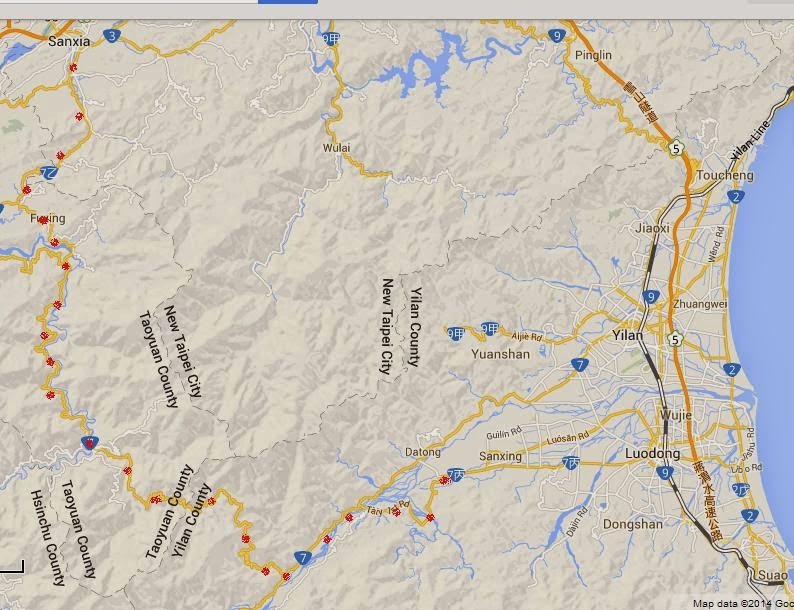 Actually, I did the Suao Hwy/Suhua Hwy - 蘇花公路 - a couple weeks ago, two days before the Lunar New Year. There were very few large trucks and buses that afternoon. I saw many other cyclists on the road. 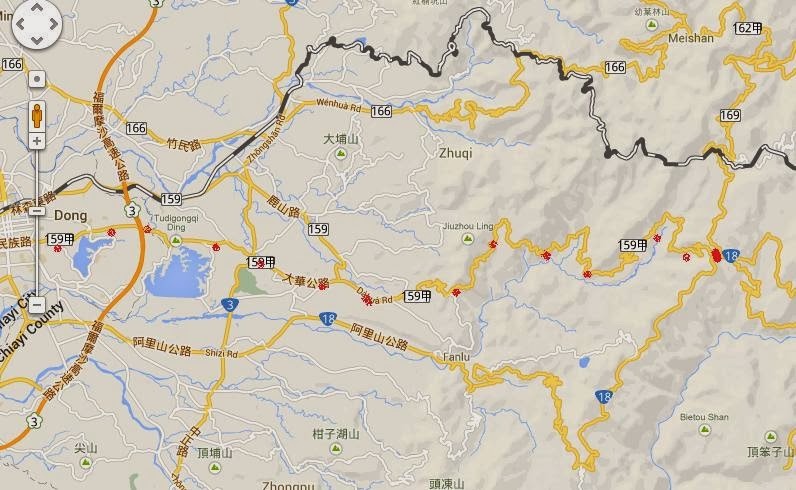 It is one road I would recommend doing at least once if you live in Taiwan and ride a lot. 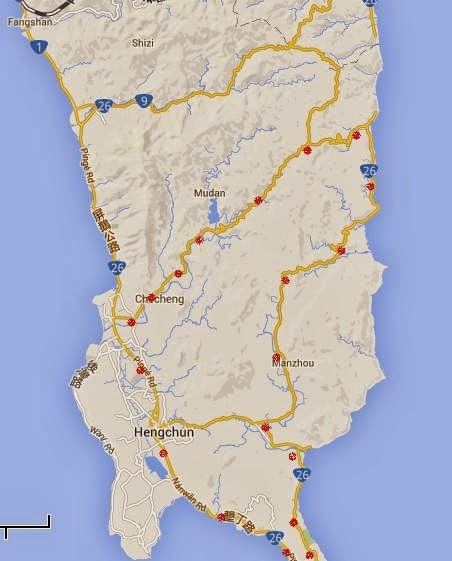 If you are coming to Taiwan to do a cycling holiday - there are plenty of roads as Michael has mentioned that will keep you busy. The 蘇花公路/Suhua Hwy is one special road - three hills over a 100km ride - amazing scenery. Yep, it's really a special road. thank you sir for the recommendation. i will sure try them out one day! I know I will be back! Hi, I've just moved here and hoping to do some cycling (trips will have to be mostly on the weekends). Initially I can hire a bike but I'd like to buy my own, can you recommend any good shops in particular? Didn't bring anything with me at all for cycling. I live in Kaohsiung. Also, do you have a decent map or tend to rely on internet/google maps? Thanks! Anon, can you email me? Craig Ferguson's Travel Photography Book Out! Those 共匪 stole our factories! What is that thing called Taiwanese identity?